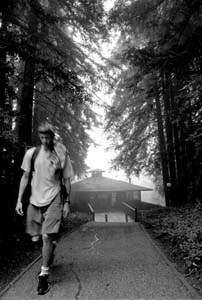 Trees of Knowledge: A student takes advantage of UCSC's extracurricular environment. A long time ago, I let my alumni status at UCSC fall into limbo. Why give people yet one more clue to how long I've lived in this lovely contrarian chunk of the central coast--and by inference (and simple math) how old I really am? Whenever I'm tempted to gather the grandchildren around for yet one more tale of how the hardy pioneer city planners conquered the native concrete and built the first Pacific Garden Mall, I head out the door and take a random walk. Before long, I'll find myself strolling through a neighborhood I didn't even know existed or standing in front of a new espresso bar or bookstore that cropped up when I wasn't looking. It's a healthy reminder that no matter how long one lives in a community, there's always a surprise around the next corner. With the exception of Pompeii and Williamsburg, Va., no place stays exactly the same. THE GUIDE is Metro Santa Cruz's introduction to both the familiar and the unexpected riches of our county. We've drawn on the accumulated experience of our homegrown staff in an effort to give both newcomers and lifers a one-stop pointer to the vitals of life in Santa Cruz: from triple lattés to all-night hangouts and spiritual retreats; from the five basic food groups (Pizza, Mexican, Asian, Breakfast and Dessert) to talking points about local political controversies. These lists are unabashedly selective, and none of them presumes to be exclusive--if we missed a good spot, give us a call or zip off an email and we'll check it out. Letters Ripped--Broos Campbell, Michael S. Gant, Matt Koumaras, Kelly Luker, Tai Moses, Karen Reardanz, Mary Spicuzza, Sharan Street, John Yewell and Christina Waters. From the September 24-30, 1998 issue of Metro Santa Cruz.